I came accross 9 as an unconventional continuation of one of the classic taisha branches. 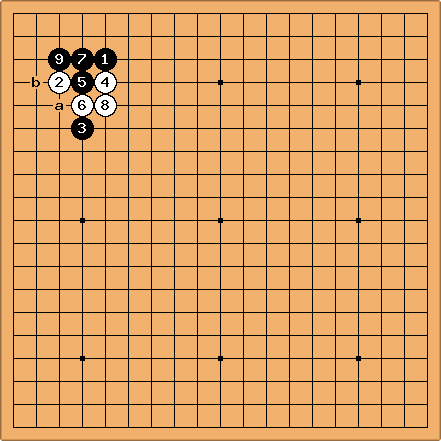 A quick search of professional games revealed that this move is never played (should be a), therefore it must be wrong. How to best take advantage of this inferior move? I descended to b; other ideas? unkx80: My own instinct tells me that at a shouldn't be too bad - the stone gets separated in a split shape. tapir: Oh, well didn't notice in my answer, thought is the deviation we are talking about (WaysToAvoidTheTaisha#toc4). Anything but a leaves forcing moves for Black, that White will answer at ''a', so playing there directly seems like the way to go. Dieter: Although you can always lie with tewari? there is only one really strange move in this sequence and it is . White is extremely happy to connect at a. Same here: can be criticized, but is not nearly as bad as . Bill: In this position it is as though Black not only peeped at a bamboo joint but then tried to cut it. John F. While agreeing that sledgehammers and nuts come to mind, this is a wiki that people use for reference rather than a comedy forum, so let us be clear that this a perfect example of tewari. There are two basic methods of tewari and move order is only one of them. The other involves looking at the final shape (i.e. the result) for redundancies, silly shapes. As it happens, both techniques seem to apply here.